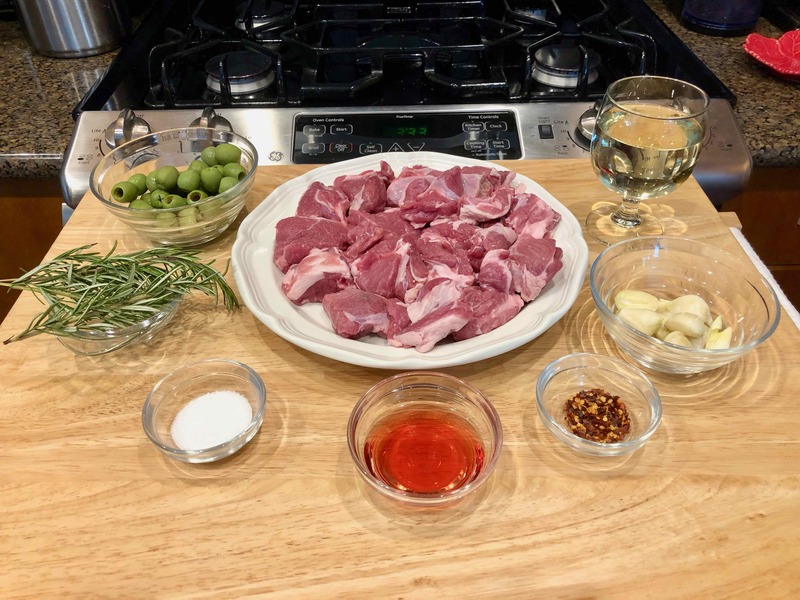 “Serve immediately. . .” When I read these words at the end of Lidia Bastianich’s recipe “Lamb Chunks with Olives” in Lidia Cooks from the Heart of Italy, I had second thoughts about preparing this dish—especially since it was for a first-time dinner guest. I didn’t want to be cooking after our guest arrived or while cocktails were being served, and now I wasn’t sure if this stew-like dish could be prepared ahead. Moreover, an online review claiming that, although tasty, “the lamb was not tender,” gave me additional pause. 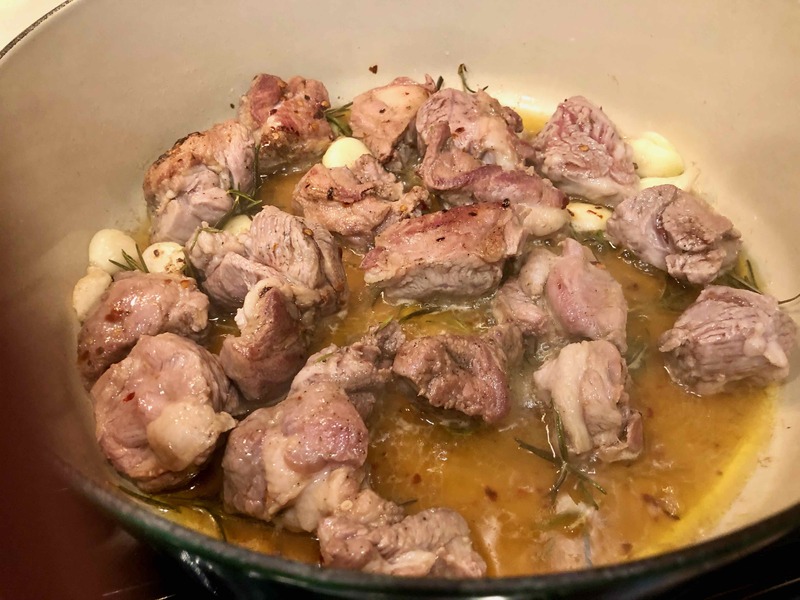 While other recipes for stewing lamb shoulder called for up to 90 minutes of cooking time after browning the meat, Lidia’s recipe appeared to require only 45 to 50 minutes in total. Despite these reservations, I forged ahead with the recipe. 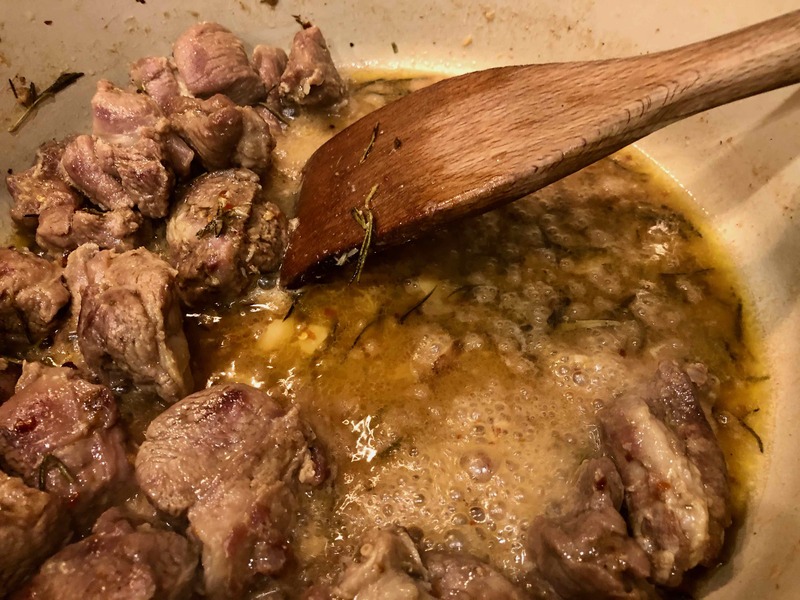 If the lamb wasn’t tender after the prescribed cooking time, I’d just add a little more wine or even some broth and continue to cook until it was. 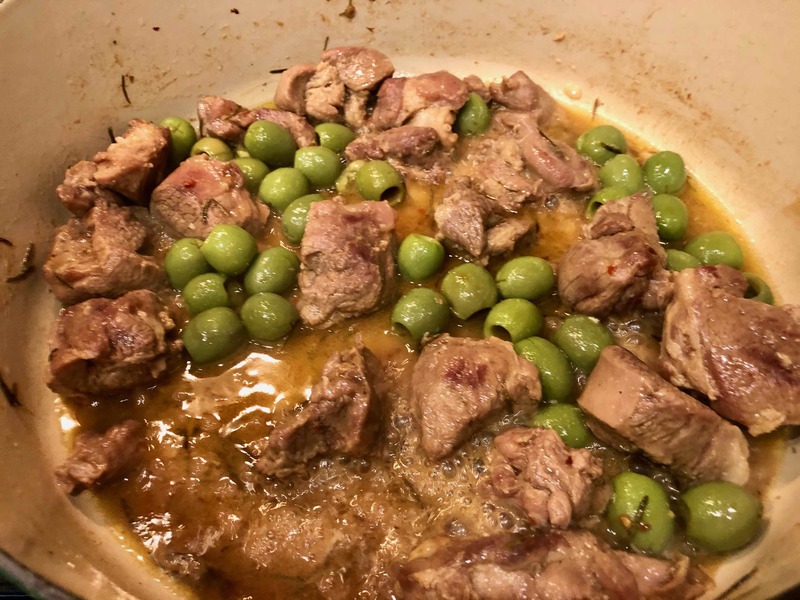 As for the “serve immediately” admonition, I decided to prepare the dish ahead and put it aside after the penultimate step of cooking the lamb with the olives for 10 minutes. When we were ready for dinner, I could slowly reheat the stew and complete the final uncovered-cooking step at the last moment. “Everything would be fine,” I told myself. I started the dish two hours before our guest was expected. But then I ran into what looked like a major problem: my lamb wasn’t browning. Unlike most recipes, Lidia’s called for slowly browning the meat covered. After the first 10 minutes, my lamb was at best grey and some chunks were even pink. Perhaps I had lowered the flame too much. I raised the heat and, after the next 10 minutes, the meat was only slightly more browned. “Be patient,” I thought; “It will brown eventually.” Once again, I raised the heat almost to the original “medium” setting. After another 15 minutes, the meat was close to being thoroughly browned and required only a few more minutes uncovered to reach the required “nicely browned all over” state. It was smooth sailing from that point forward. The juices had thickened and had begun to caramelize; the excess fat was easy to remove; the wine and vinegar facilitated deglazing the pan. In went the olives and on went the cover. Ten more minutes of slow simmering and all looked good: an adequate amount of sauce, slightly softened olives, and perfectly tender lamb. The doorbell rang and all was right with the world. 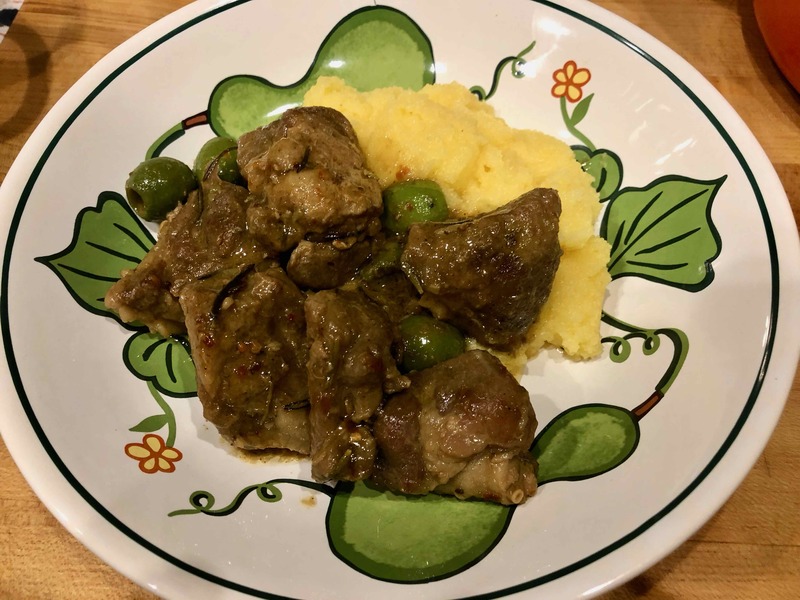 A few minutes before we sat down to dinner, I brought the meat back up to temperature and cooked it uncovered for a few minutes, following the recipe’s directions to “tumble the meat and olives in the pan, coating them with the sauce.” I served the dish accompanied by a simple polenta. The ideal lamb dish to celebrate Punxsutawney Phil’s prediction of an early spring. 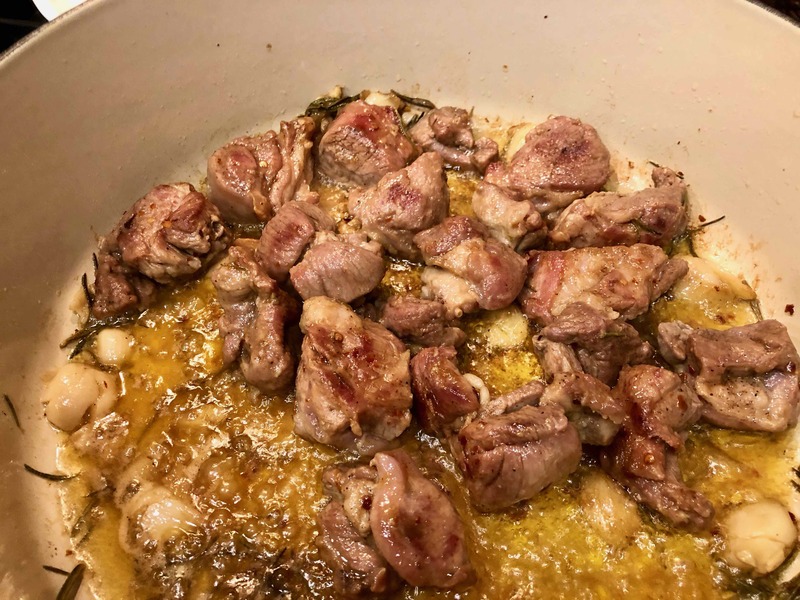 Trim the exterior fat from the lamb shoulder or leg, and cut the meat into 2-inch pieces, removing fat and bits of cartilage as you find them. Pat the pieces dry with paper towels, and season all over with 1 teaspoon of the salt. Pour the olive oil into the pan, and set it over medium heat. 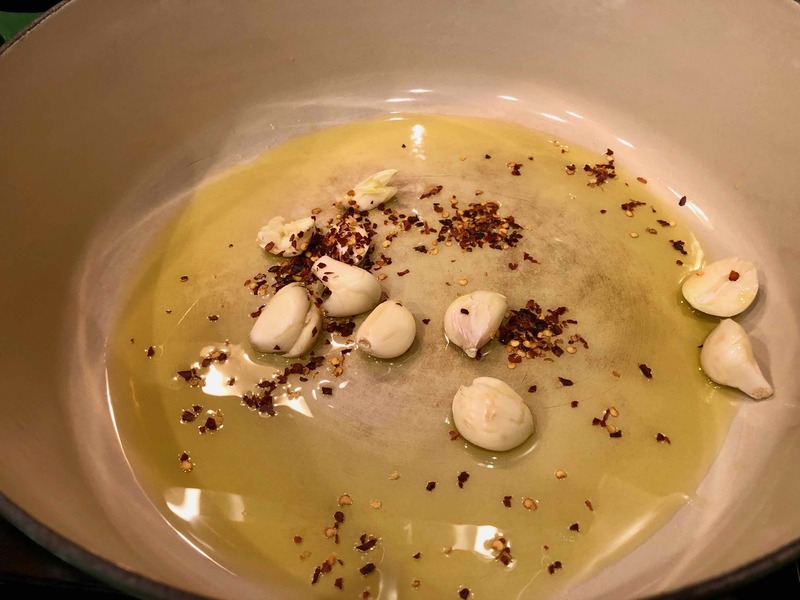 Scatter in the crushed garlic cloves and peperoncino. 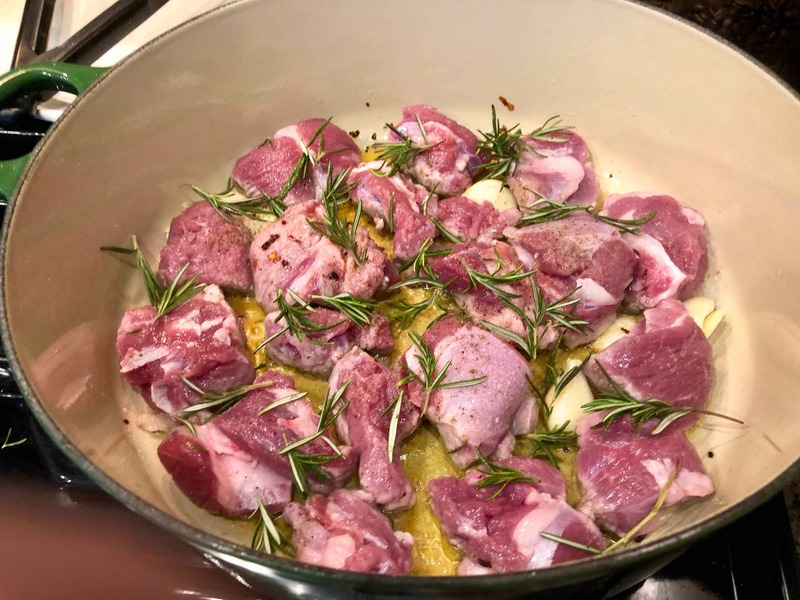 When the garlic is sizzling, lay in all the lamb pieces in one layer, scatter the rosemary on top, and season with the remaining teaspoon salt. When the meat starts to sizzle, cover the pan, lower the heat, and let cook gently, browning slowly and releasing its fat and juices. After about 10 minutes, uncover the pan, turn the pieces, and move them around the pan to cook evenly, then replace the cover. 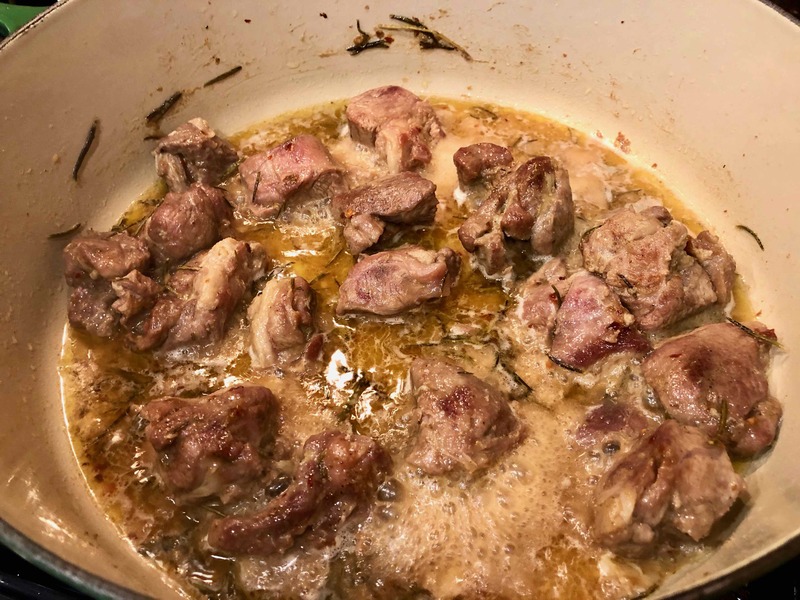 Turn again in 10 minutes or so, and continue covered cooking for another 10 to 15 minutes, until the lamb is nicely browned all over and the pan juices have thickened and caramelized. If there is a lot of fat in the bottom of the pan, tilt the skillet and spoon off the fat from one side. Stir the wine and vinegar together, and pour them into skillet, swirling them with the pan juices. Turn up the heat, bring the liquids to a boil, and cook them down quickly to form a syrupy sauce. 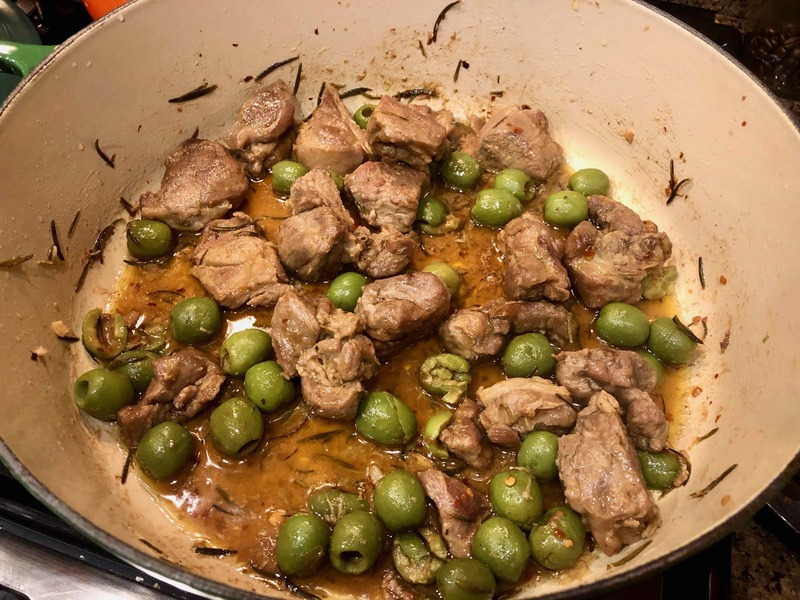 Drop the olives into the pan, all around the lamb chunks, then cover and adjust the heat to a bubbling simmer. Cook for another 10 minutes or so, again concentrating the juices and marrying the flavors. Finally, cook uncovered for a few minutes, tumbling the meat and olives in the pan, coating them with the sauce. Serve immediately, right from the skillet, or heap the meat chunks on a platter or in a shallow serving bowl. Spoon out any sauce and olives left in the pan, and drizzle over the lamb. Next Article A Meatball by Any Other Name. . .
A nice meal to honor Punxsutawney Phil and one I’d enjoy as well. Lidia’s recipes have yet to fail me, although I’ve questioned her cooking times more than once. Agree about the cooking times; don’t know if its Lidia or the editor.